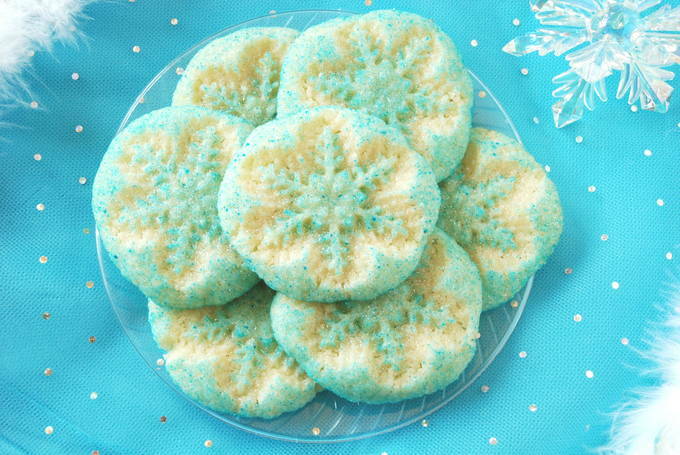 I think Olaf would love these snowflake sugar cookies inspired by the movie “Frozen”. They’re chewy, moist, and perfectly sweet. 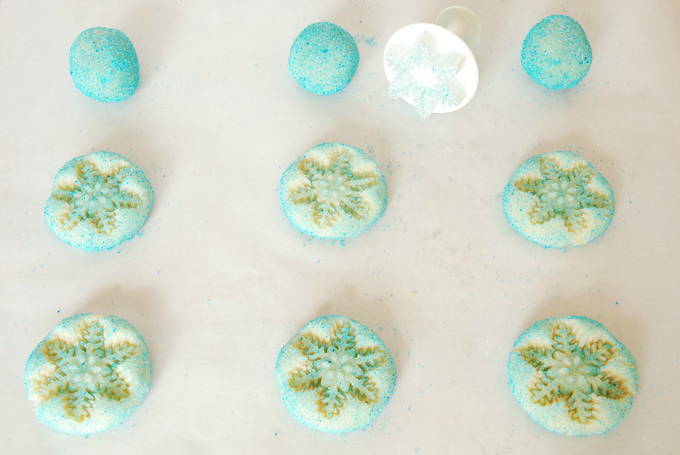 The blue sugar, sparkle, and snowflake embossing makes them decadent enough for Queen Elsa. Everyone will have a hard time keeping their hands out of the cookie jar – that’s for sure. These would be fun to serve at a “Frozen”, winter, or ice skating party. It’s an easy recipe to make. 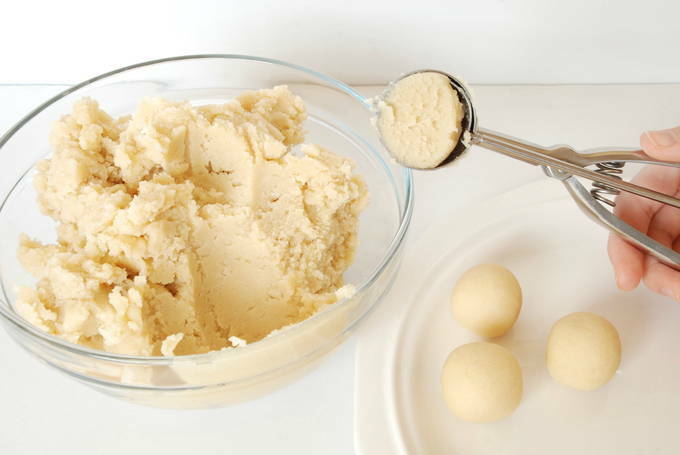 A flour mixture is added to a creamed mixture – then the dough is scooped into balls. Now it gets fun – you roll the dough into a ball and then roll the ball in the blue colored sugar. 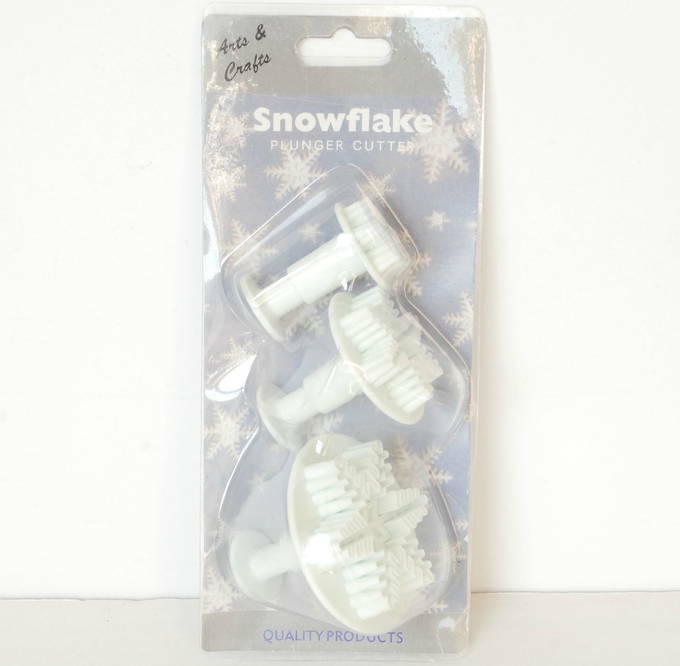 Next, the middle size plunger (in this nifty plunger/cutter set) is gently pressed down onto the ball – to make a beautiful snowflake. If you prefer, the dough balls can simply be rolled in white sugar. Then the balls are pressed down with the bottom of a drinking glass to flatten them. 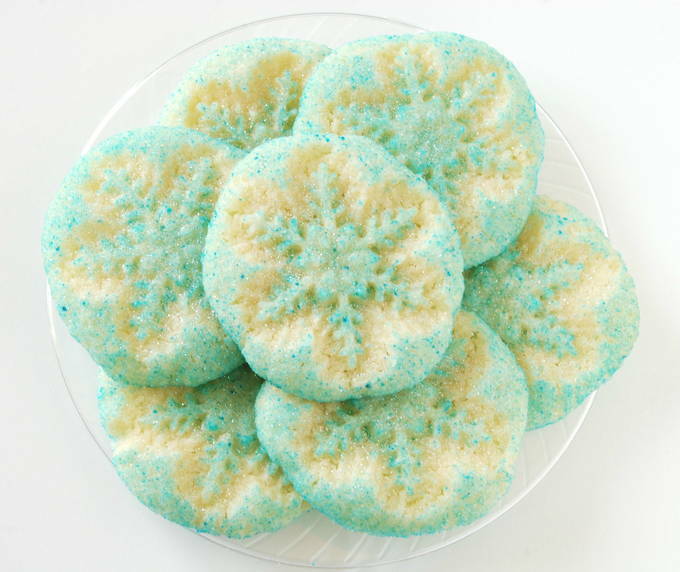 With or without the embossing, color, or sparkle these are special sugar cookies. 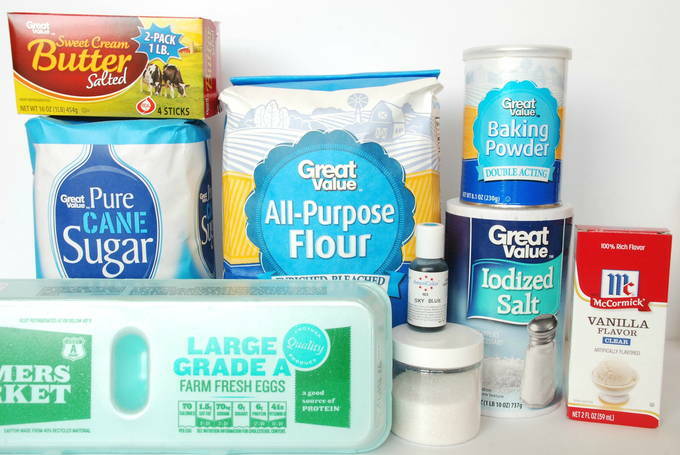 Here’s what you’ll need to buy (to make a large batch of three dozen). 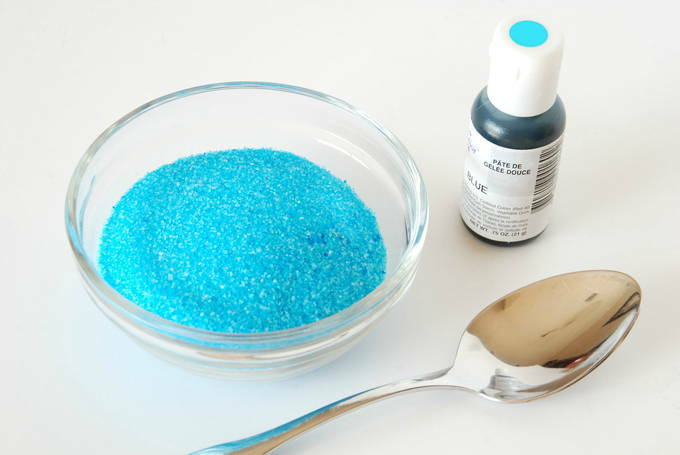 Check to see if you have a blue food coloring in your pantry. Optional: Rainbow Disco Dust – not available through Walmart. To make the sugar topping pour ¼ c. sugar into a small bowl. Add 2-3 drops of food coloring to the bowl. Preheat oven to 350°. Prepare baking sheets by lining them with parchment paper. 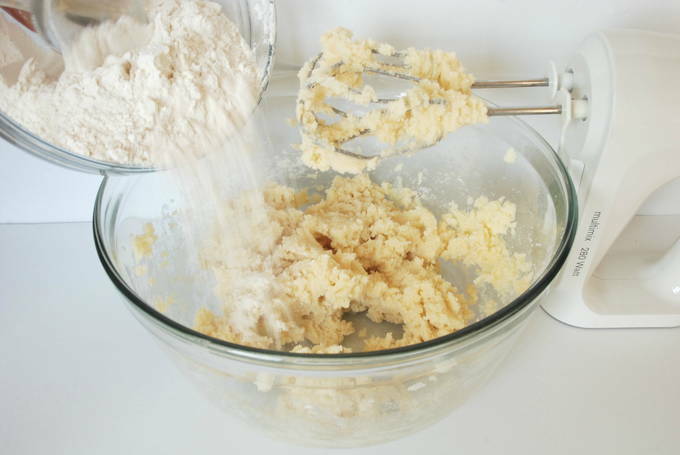 In another large bowl with a mixer on medium speed, cream the butter then add 1½ c. sugar. Mix these for two minutes, scraping the sides of the bowl. Add the egg and vanilla and mix one minute. Pour in the dry ingredients a little at a time and mix thoroughly. Bake for 9-10 minutes. Slide the cookies/paper from the baking sheet to let them cool. (Optional: Immediately sprinkle on the Disco Dust.) Bake the remaining dough 12 balls at a time. When I was making the cookies I kept hearing, “Are they ready yet? All of us were dying to get our hands on them. They’re popular because of how yummy they are, not just because they’re pretty. I plan to get more plunger/cutters with other shapes. They emboss such a nice print and are easy to press. Kids will have fun helping you make the snowflakes.